Holy chocolate. I’ve been making this giant fudge-y brownie, from Jacques Pepin’s Fast Food my Way, for over a year now, and with good reason. It’s gluten free, although I’m not so sure it was designed with nutrition in mind. 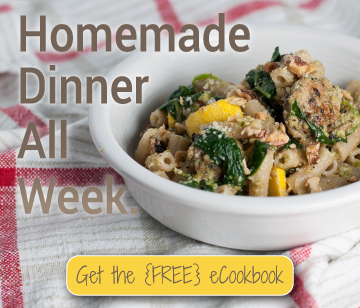 For a recipe authored by a Frenchman, it’s unexpectedly simple, quick, and easy. It also falls into one of the few flavor categories of desserts that my fiance will consume. On the no-no list: berries, cherries, apple pies or tarts, caramel, and marshmallows. I know (love you honey). I suppose it works out, since I can protect my dessert from intruders by ordering or making, say, rocky road blondies or dulce de leche cheesecake. Being so close to Valentine’s Day, I took some liberties and decked this brownie out. It’s not as if all that sweet chocolatey-ness needs anything, but I read half of the Icings chapter in Joy of Cooking (yes, kind of for fun), and I learned that a bittersweet or dark chocolate icing can be a nice contrast with a super sweet chocolate dessert. Kind of obvious when you think about it, but I guess I just hadn’t. Then, for whatever reason, I felt possessed, amidst all the richness, to go all healthy with the whipped cream. Does it really matter when I have a cup of sugar in the brownies and almost a pound of chocolate in the finished product? Maybe not, but I’m actually more likely to have coconut milk on hand than heavy whipping cream, seeing as it’s stored in the pantry. Despite cooking my way through the gratins in one of my new cookbooks, I’m trying to limit my dairy intake at other times. 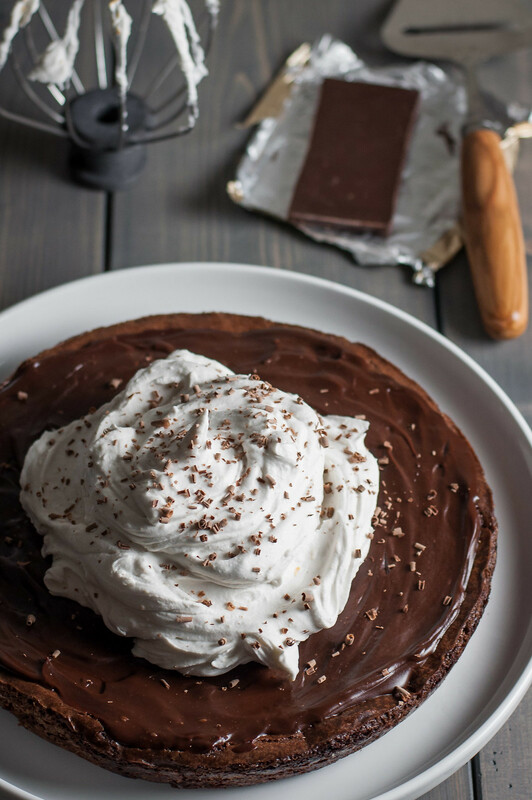 I used to be more all-or-nothing when it came to healthy eating, and if I was having this much sugar and chocolate, I would have just taken the junk food hit and gone all the way with the whipped cream. Not as much lately, as I shift to the mindset that every little step does count. If that’s almost a quarter cup of animal products that I can exchange for coconut cream, then by golly, I’m goin’ for it. As long as you’re making conscious choices, though, I’ll by no means judge you for going with “real” whipped cream. Or even fake whipped cream. Or–ICE CREAM. Genius. Or coconut milk ice cream, which I paid dearly for the other day at Whole Foods but is turning out to be pretty tasty. The brand is Luna & Larry’s, and I’d buy it again. Jacques’ original brownie recipe calls for hazelnuts. I’ve made that variation, and it’s quite good, but those things are expensive. So unless you live in hazelnut country (the pacific northwest, where I consumed many of them once upon a vacation), I suggest going with walnuts, or even branching out to something you have, like pecans, macadamias, or shelled pistachios. Oh, pistachios, why did I not think of that until now? Yum. Valentine’s is a weird time. It’s like I want to get into the theme and offer up some ideas, but I don’t want you to read this post with burning resentment if you’re single. Do you have a parent? A sibling? Some amazing besties (yes, just used that word)? Cool coworkers (lucky you)? Okay then, share this brownie with them! Really, I’m so happy to be at such a feel good place in my life with a fiance who has planned Valentine’s Day for me already, and maybe it’s all the yoga talk, but I think everyone deserves some happiness and good people in their life and brownies most of the year. Chances are, there is something, or more specifically someone in your life that you’re grateful for, even if it’s a small bit in an otherwise stressful or difficult time. I know it’s easier said than done, but my life has not always been as peachy as it is right now, and I think in those times it would have served me well to look for the good (definitely not often what I did) and make brownies. Try it! This dessert's tagline is "easier than it looks". 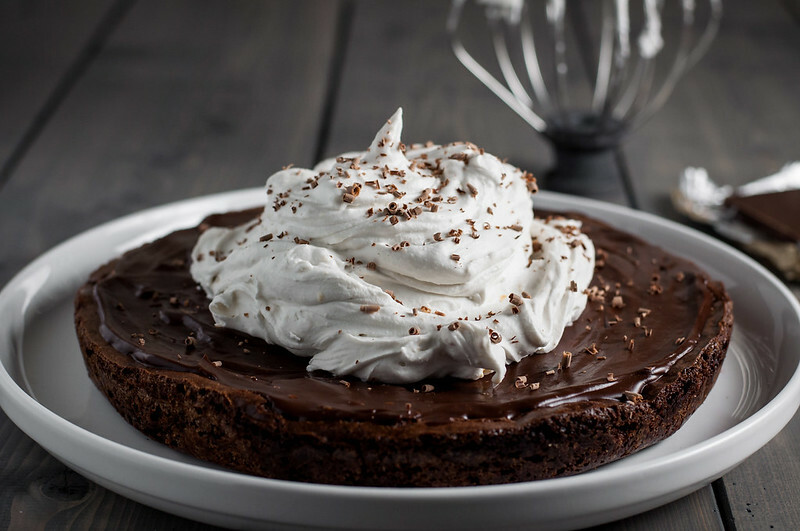 If you have a few basic baking staples, whip it up for after a special dinner or an indulgent weeknight treat. Preheat oven to 350. Spread nuts on a rimmed baking sheet. 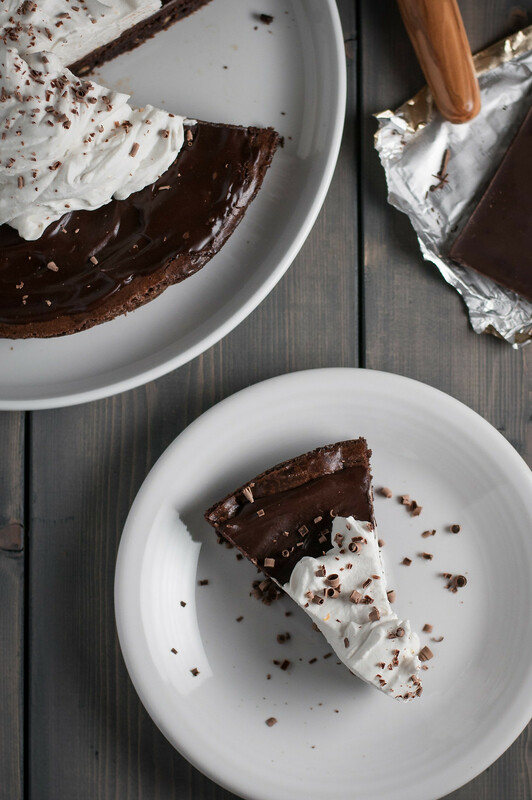 Line a one piece 8 inch cake or tart pan with a single sheet of foil, leaving some overhang. Grease foil with 1 teaspoon of the butter. In a microwave safe bowl, combine 6 ounces chocolate and remaining butter and heat for 1 minute on high. Leave alone for 5 minutes, then heat another minute. Remove from microwave and stir until smooth and combined. Roast nuts about 10 minutes, stirring halfway through. Cool slightly, then transfer to a plastic freezer bag. Seal bag, pressing out air, then wrap the bag with a dish towel. Use a rolling pin or small, heavy pan to crush the nuts into small, but recognizable, pieces. Combine sugars, eggs, and vanilla in a medium mixing bowl with a whisk, until smooth. 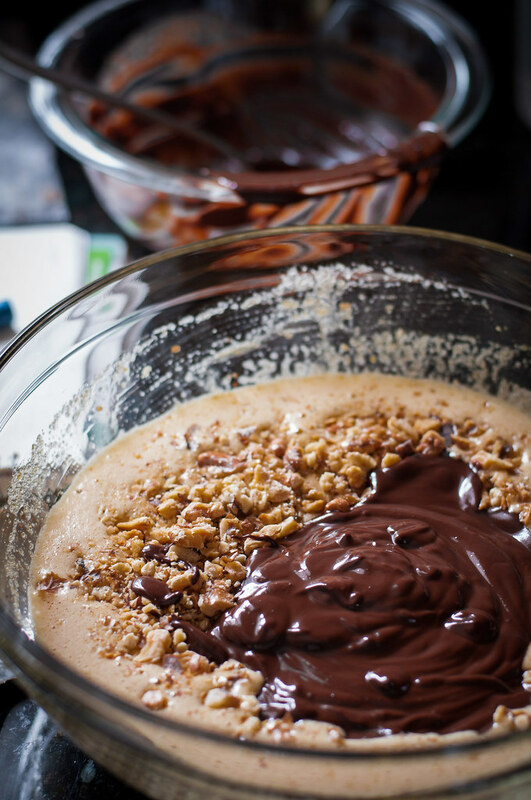 Add nuts and chocolate mixture and fold in with a rubber spatula until fully combined. Pour batter into prepared pan and bake 20 minutes, until a toothpick inserted in the center comes out slightly wet. Cool in pan on a wire rack to prevent cracks. When completely cool, lift brownie from pan by foil overhang. Use one hand to gently lift brownie and remove foil with other hand. Slide gently onto a serving plate or back into pan. When brownie has cooled completely, coarsely chop chocolate and combine with water and salt in a microwave safe bowl. Heat for 90 seconds at 50% power, stirring halfway through. 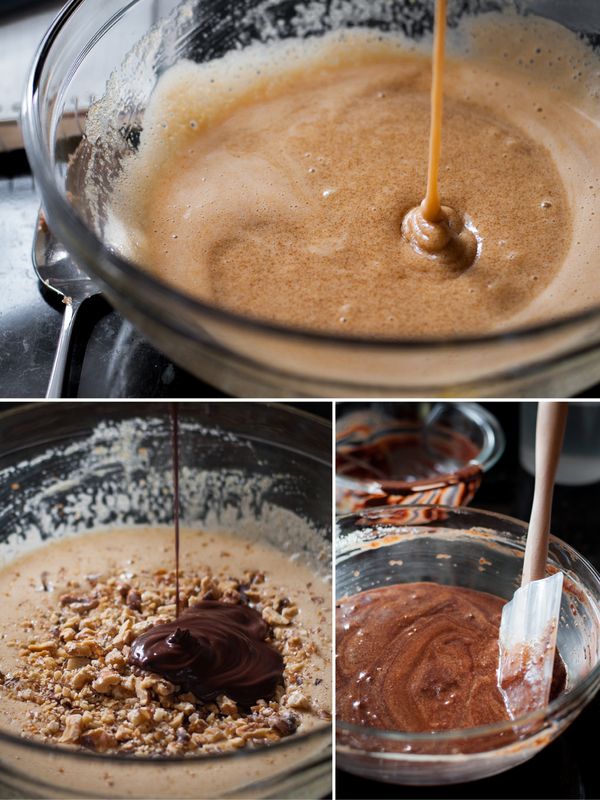 Stir again until chocolate is melted and mixture is smooth. A few pieces at a time, gently stir in butter until each addition is melted. This takes 5 to 10 minutes. If the chocolate cools so much that the butter will barely melt, microwave for 30 seconds at 50% power. After adding all the butter, stir until mixture is completely smooth. If using, stir in triple sec. Cool about 20 minutes (to about 90 degrees F), so the glaze is pourable but has thickened slightly. Pour ¼ cup glaze over brownie, spreading evenly with the back of a spoon, almost to the edge. This layer will fill any cracks in the brownie, so it's okay if crumbs appear in it. Refrigerate glazed brownie, uncovered, 10 minutes. Pour about ⅔ cup (or to desired thickness) of remaining glaze over the first layer, again spreading evenly with the back of a spoon. Allow to set at room temperature or more quickly in the refrigerator before serving. If making ahead, refrigerate the brownie, covering with plastic wrap after the glaze has set. Best prepared immediately before serving. Chill a mixing bowl or the bowl of a stand mixer for 10 minutes. Turn refrigerated cans of coconut milk upside down and open from bottom. Pour off separated, semi-translucent liquid (reserve for smoothies). Scoop firm, white milk into chilled bowl. Beat with handheld electric mixer or the whisk attachment of your stand mixer until fluffy, about 5 minutes at 60 to 80% power. Add sugar, vanilla, and zest, and whip again until incorporated and sugar dissolves. 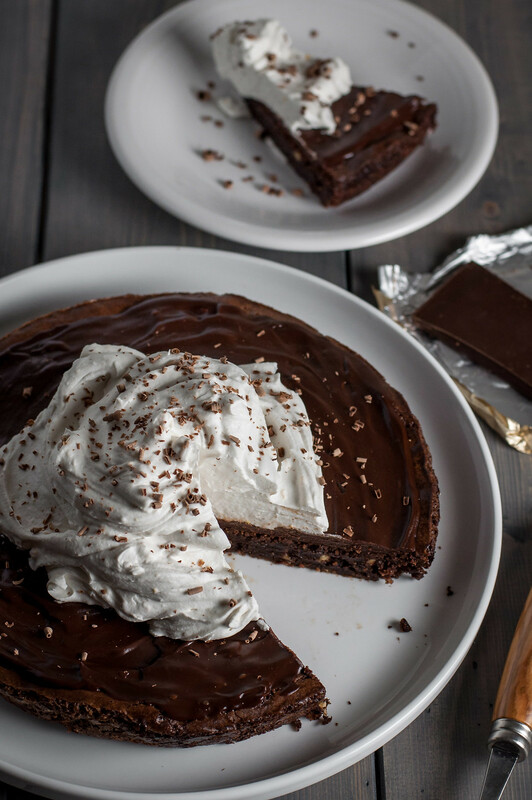 To serve, pile all the cream onto the brownie (for a dramatic look), cut, and serve. Alternatively, if not serving all at once, scoop cream onto individual slices of brownie. Finish with finely shaved (on a microplane or cheese slicer) chocolate. To make ahead, refrigerate cooled (and glazed, if you like) brownie. It's tasty served cold, allowed to come to room temperature, or even warmed briefly. There's lots of buzz around the internet about which brands of coconut milk separate when refrigerated, thus enabling their use in this recipe. "Guar gum" as an ingredient supposedly prevents separation, but both cans I used contained it, and both separated and worked well in this recipe (Whole Foods organic and Native Forest organic). If in doubt, purchase a couple different brands, if available to you, and refrigerate them both, in case one doesn't work. Prep time for the brownie alone is 30 minutes or less. The coconut cream is going on 5 days in my refrigerator now, and it's still fluffy and ready to use. Glaze from Joy of Cooking; whipped coconut cream inspired by Oh She Glows. Note: this page may contain affiliate links. It does NOT contain sponsored content. 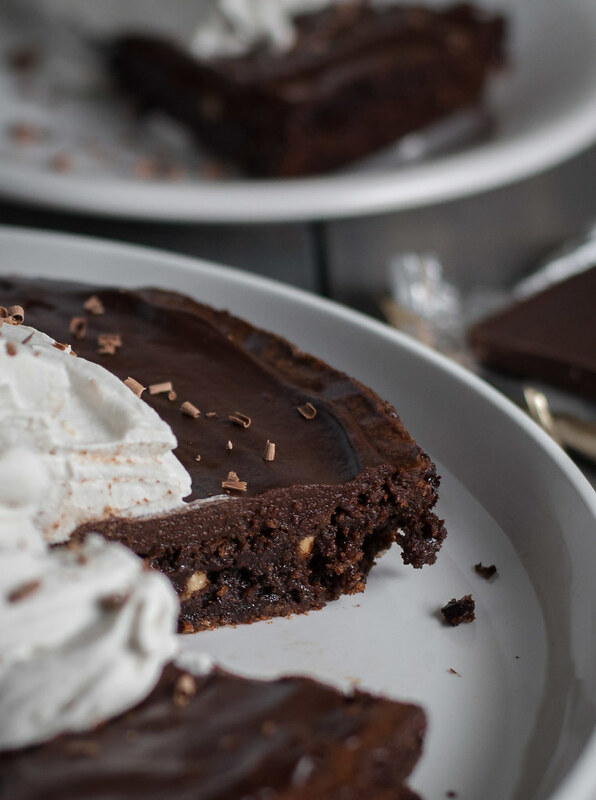 Affiliate links (to products I recommend, on Amazon) offset my food and website maintenance costs, so I can keep bringing you chocolatey recipes like this one. Thanks! 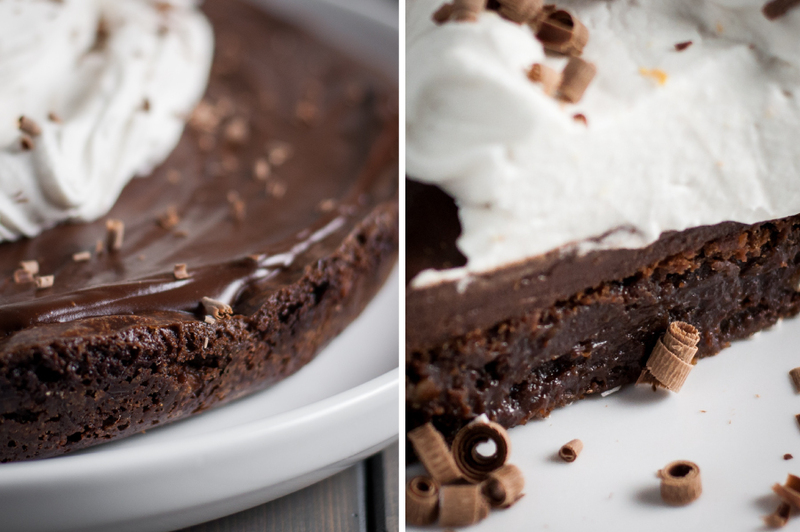 now this is one decadent and delicious brownie tart! 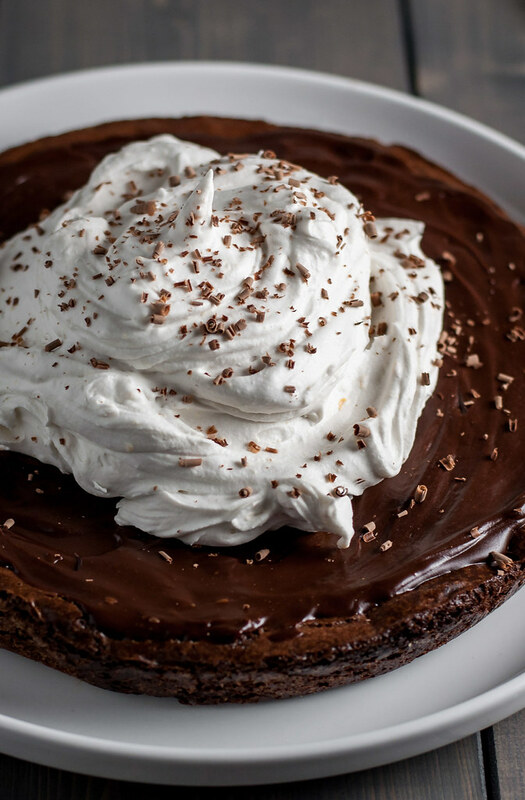 i am seriously just drooling here over the images.. and all that coconut cream ontop! I honestly just threw the whipped cream on and it happened to form into a perfect cloud! I’m sure you know how it goes…food styling seems to work best when you’re not even trying. I am dying over this. You are making me want brownies at 6:30 in the morning!! Ain’t nothin’ wrong with dessert for breakfast :) Thanks! So true, Kathleen. I think I might have been fed so much Cool Whip as a kid that my body would reject it. My goodness, what a stunner!! 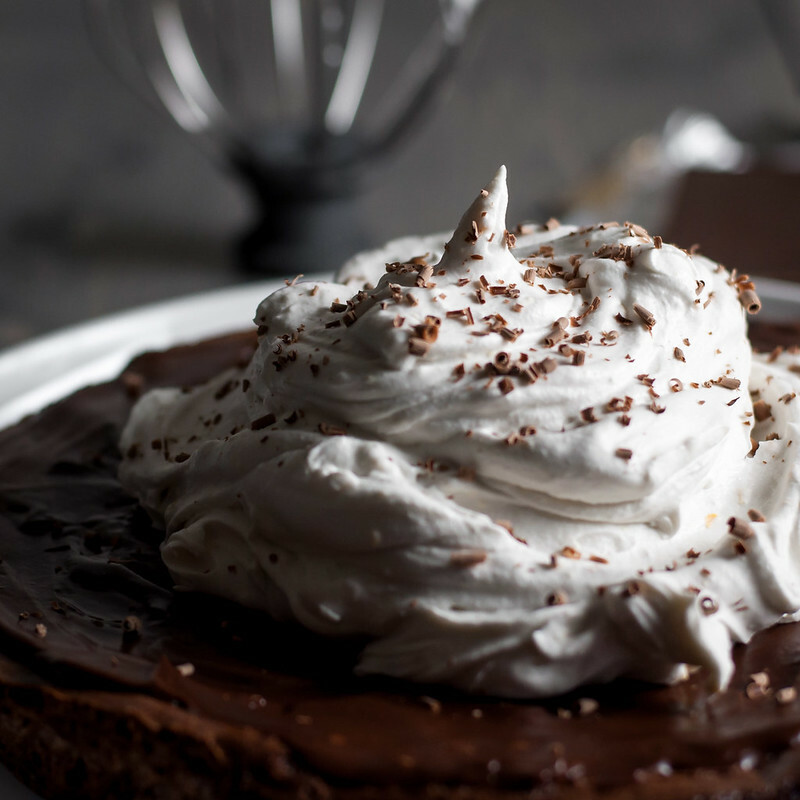 That coconut whipping cream is beautiful. Genius recipe! It was pretty tasty :) It will be a fight in our house tonight over the last slice for sure.